After long time, I tasted one of my favorite drink ‘goli soda’ (marble soda), when I was near chengalpet – a town near to Chennai. It’s a common carbonate drink, enclosed in a bottle and sealed by a toy marble. There’re different types of sodas, known as color soda, paneer soda, ginger soda and lime soda. The color soda comes in three flavors such as cola, orange and green. In all these, I use to drink Paneer soda the most and I love the savor which tastes alike rose water. Since it was the only soda sold in our area then, next to the typical one. There are times I wonder at marble sodas, that how came the marble inside the bottle and how it was sealed. 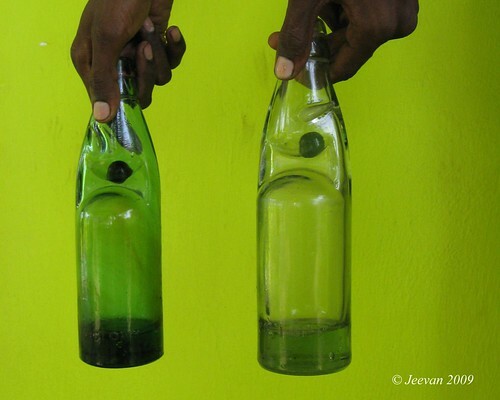 Having seen many a days, how these bottles are arranged on the handcarts and pulled by man to deliver it to shops, I haven’t known how these marble sodas are sealed, until I checked this video. One of an incident I could not forget was on the way through a village less than a decade ago, where I find color sodas on a store suddenly and indirect my dad who was driving! Thus he missed the speed breaker ahead and the car bumped huge and displaced everything inside the car and then stops the player to sing never again. From then, whenever we come across that village and sometime on huge speed breakers, this incident comes at instant. Near to my grandpa’s home in Chennai, there was a marble soda company named Gugan & co. Whenever I visit my grandpa’s home and from their balcony, I used to watch the morning activates of this company being carried out the soda bottles in handcarts and rearranged it as per there delivery. The bottles would be arranged in wooden boxes, with a set of bottled keep upright and another set in inverse position to adjust the space, and every bottle seems alike, I used to think why the old man (who I usual see there arranging bottles) just keep on changing the bottles from one box to another. The marble soda always attracts me and marbles being one my favorite things to play then, I use to think about hoe to get it out. Today we don’t see much marble sodas in stores esp. in cities like Chennai. Opening the bottle is another excitement and it can be open in two ways, by keeping our thumb or a specially designed block on the marble and strike with our palm to push the marble inside. In marble sodas, it’s always a trouble drinking it quite, as the marble that remains in the neck of the bottle used to block the mouth of the bottle while we tilt, so we need little cause to drink the soda. After much occupation of international companies, the marble sodas face a hard time to survive and it exists only in rural sides and hardly suburbs today. It’s quite calm after we come across Barijam junction in kodaikanal, except few vehicles pass on, its more nature and we. In search of nice place to have lunch, we stopped somewhere to wonder that it was the same place we had our breakfast a decade ago. It’s a piece of grass land and green bush surrounded. The wind blows so cold and pleasure; and we parked our vehicle beside and spread the mat. More than having lunch, it was the place that impressed me and wanted to finish lunch soon and to move few distance along the road. It was quite pleasure and I was on wheels, along the pine shrubs and eucalyptus trees for sometime. There was a pristine stream then and it still exists. But sadly it was surrounded by waste wrappers and dumped litters today. 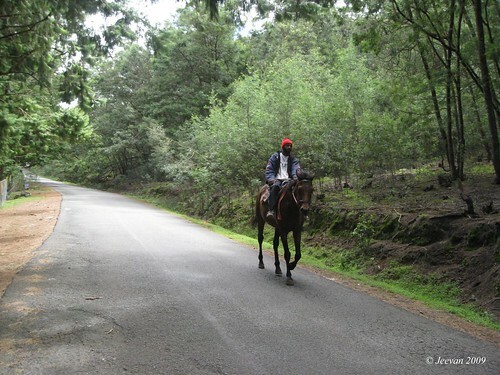 On the way I saw this guy training his horse by sitting on its back, riding fast and on paces in kodaikanal. The horse sounds like worn horseshoes and seems like it was on sever training by his owner and thus the horse obeys his order, bearing the whips he gives. The strike just resonates still in my sense and the sound it response to his sudden brake, like a car strikes. I just wonder, how much strain does those horses that merrily goes around the Kodai Lake, should have born to bear visitors on its back to sustain and kind being! With less than couple of rounds, he rides away... and we get packed and moved, after sometime being relaxed. Dad was off to an event and turned home lately by 11.30pm and after watching my favorite shows on television, waited sometime for dad to arrive and headed to bed in happy mood across mid night. After some conversation still lied on bed, I teased dad merely, for gone to the event (where people gather together) and warned to be cautious not to bring home swine and went into deep slumber soon. More than an hours was past, I suddenly waked due to a mild constant cough and wanted to spit. I tried to control, and when I feel I can’t, I waked dad to bring split vessel and so he brought and I split. One may wonder what strange about this and it’s a usual thing everyone does in spite to split. 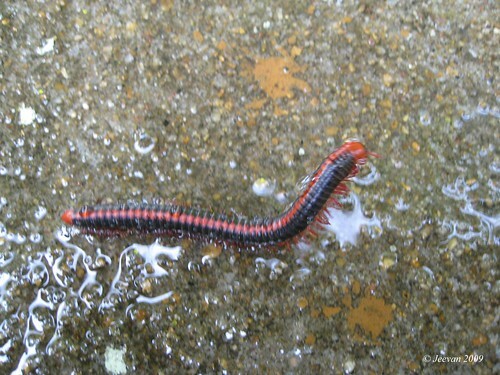 But what I split just put me in shook and scare, because it was pure red in color. I mean blood! I wasn’t expected and never like ever and after splitting blood and in between for sometime, I was feeling tremble in fear along with mom’s scare; and what put me more into scare is the amount of blood I split and it could be about 50ml. Dad was saying it’s because of heat and along in disbelief, they don’t know what to do and in hesitate whether to go to the nearby hospital or not. Mom inclined me on her and embraced. I tried hard to prevent spitting and in sometime I laid on bed with raised pillows and fight to sleep, keeping away the fear and trouble. After couple of times waked in between, I caught up with cold fever in cause of fear and tremble, I lead the night in sustain fear and somehow the blood stopped coming and thus it gets me some symptoms of courage and confidence. Only after early morning, I began to sleep slightly, with throat feeling hard to swallow even the saliva and it sustained for the whole day. Being waked away, I slip to see no blood to exit and it certainly put me in pleasure and brings hope that it was a reflection of heat and throat infection. Being clarified by aunt and uncle that it’s a general thing happens of heat and throat hurt, and that in my case blood had come more and makes me scare. After taking medicine, it was ok then and later. Being Sunday the next day, our family doctor won’t visit his clinic, and though the blood stopped coming then, I took some antibiotic pills and felt comfort somewhat. But I can’t be just like that and feeling uncertain about the cause, I visited our doctor on Monday evening and he gives me much confidence that it was nothing than a throat infection and gives some piles. Now I feel much better and hope to be fine soon. in memories of her only soul son! To mom, who quite disturbed and loved to be in memories of Karthik anna (bro). Last week I watched Pokkisham (treasure), and I was convinced not to miss this movie and it was the last day of the movie to be screen on the only theater I could visit – The Drive-in. I avoided reading reviews and except preview, I went to watch the movie just like that and impressed upon the emotions, the value of communication, beautiful composition and cinematography. Here I like to share my view on the movie that moved me. The movie revolves almost around 70’s and makes certain the feel of those days, I wasn’t exists. Even the story was simple; the screenplay bears much emotion, expressions of love and great patience of post letter transmission. Lately we never aware much about the importance of writing letters to someone and waiting for days to get replay. In just few click we pass our message to one at some corners of this world today, with advance technologies like internet, emails, SMS… and cell phones have become an integral part of our lives and thinking back becomes lesser these days. Must appreciate director Cheran’s cause, to bring back those days to sense and makes us think how precious waiting means and writing a letter from our heart. We need more patience to watch the movie, since it moves snail pace and gives much time to experience the sense. Cheran has understood only with love, certain sense of oldness can be felt and explains the only communication via post those days, other than rare dial telephones. He disclosed the letters between two hearts and says more than hi, how r u, there is so much to develop the relationships by encouraging good thoughts and human sense and rights. Since letters rule the movie, the postal service and post boxes deserve there best approval. In love cheran holds umbrella to the post box and following postman, to check his letter is on progress to its destination are significant even it seems poetic and funny. Many scenes have been shot in Kolkata; the hand pulling rickshaws are remarkable to the movie, replacing oldness along with bull carts and moped used by cheran. I wonder every time looking at Padma Priya’s expression inside the closed curtain and I look in disbelief, how many beautiful and intelligent visages must be hidden within many curtains of Muslim women. Unaware myself, I get little anger on the community to make certain, women are within intense religious belief and suppress there freedom to chose their carrier. Somehow the movie comes closer that more than belief, it’s regarding human being… but later failed to be constant. The Nagore and sea shores are well captured and the beautiful visage of Padma Priya composed in a song via nature, where cheran travels in a bus is pretty adorable. Keeping away the violence and hatred, they have shown emotional pain and suffer in love, the beauty of blooming hearts, where alike butterflies flapping wings. The shore knocked boat, cheran’s single cot room and the way letters penned down and the silent expressions are way to romance. The title names that falls on the pictures that treasure early Chennai and Kolkata, is one worth befit to the movie. At last everything says the song NIla Nee Vaanam Kattru… quite treasure! Today was Chennai’s 370th birthday and here is a shot note about Chennai city and its existence. Been appeared to the world as a simple fishing hamlet, today Chennai seems to be one of the most important and 4th largest city in India. 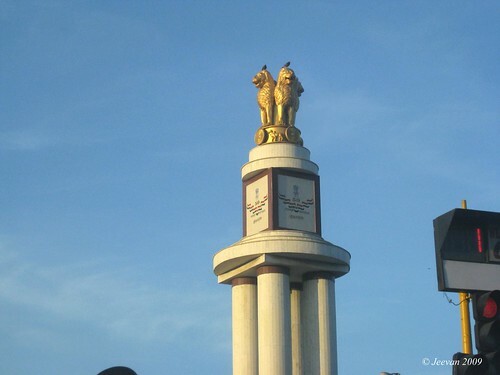 In 1639 August 22nd, the so called Chennai today, was formed by then as Madras was happened to develop as a city only after the arrival of Europeans to immigrate here. Portuguese to be the first to immigrate here in 1552 had been settled in Santhome area and have been doing business. The place where today the Chennai High Court exists had a temple then, called Chennakesavar and around the temple there was a hamlet named Chenna Kesavapuram. On 22nd August 1639, Francis Day and Aandru Kohan of East India Company had bought the land where St. George Fort was today, from Chennapa Naicker. In memories of him, the village on north side of the Fort was called Chennapattinam and the south as Madras. 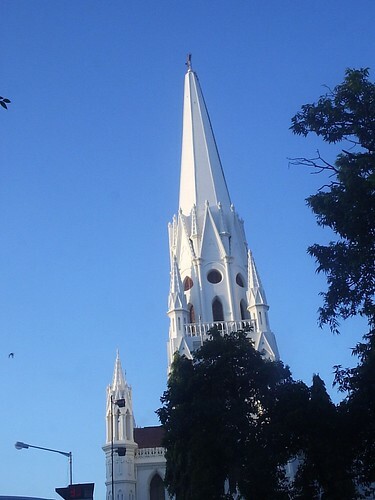 The British then merged both the villages and named it Madras, and Tamils kept calling it as Chennapattinam. In medical industry, Chennai shines as a capital with immense hospitals around and next to Bangalore, Chennai continue to be so as an IT hub in list of large cities with many motor vehicle factories are formed in Chennai. In movie making, Chennai remain next to Mumbai. 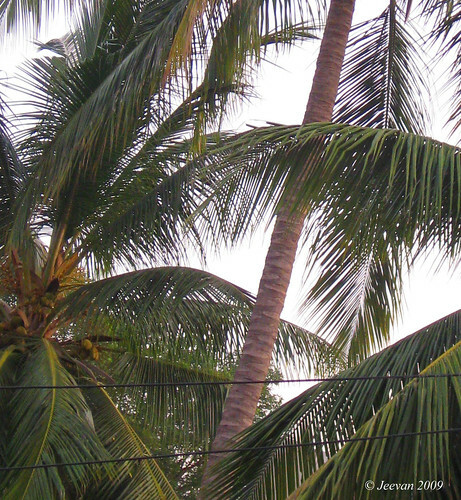 Alike many other cities in India, Chennai has its part of troublesome too. Scarcity of drinking water (thankfully lately the problem is less, since reservoirs around Chennai gets enough water by rain and linked by canals), lack of proper rainwater draining system to not even withstand a little showing (thanks to ‘J’ government to come up with a wonderful rain water harvesting project to increase ground water level and reduce water wastage), announced and unannounced electric resistance, unending traffic and more unsolved problem are there to find solutions. While celebrating the Chennai day or week, let people think to do something to make certain problems are solved and esp. the vehicle traffic and rainwater draining. Government should also think about to control the vehicle population in city to reduce traffic and pollution. I wish chennaities a very happy birthday of our city and I wish to write more about Chennai and hope to do so sometime soon. First time in India, a special school for Muscular Dystrophy students is inaugurated by Chennai Corporation on Thursday. In presence of Chennai Mayar M. Subramanian, deputy Chief Minister M.K. Stalin opened the school for children with MD in his own assemble constituency Thousand Lights. With adequate facilities for wheelchair movements in barrier-free environment and spacious restrooms with specially designed toilet seats, the school provides education along with physiotherapy and speech therapy. The deputy chief minister says “the school is opened on past prime minster Rajive Gandhi’s birthday, who was interested on the development of youngster society. Not alone the corporation and government, even the service organization should take part in this to make it success.” It’s been 3 years since I heard the MDA announced to begin a special school for MD children and it happens at last. It seems there’re 3,000 MD patients in Chennai and about 30,000 throughout Tamil Nadu. Being one and faced the trouble with MD, and going to school alike normal children is not easy, and many a students are forced to use wheelchairs when come to a certain age and period, and with the familiar Duchenne muscular dystrophy, students are dropped out of school for inconvenient. I agree, we need certain basic education to develop our knowledge and to communicate with world, and also to express about our sense and knowledge we gain through our experience. So far 28 students have been registered with the school and the corporation teachers are trained to handle these students, the government is requested to provide special buses to this school. Must thank Union minister of state for Social Justice and Empowerment D. Napoleaon and Mayar M. Subramanian for being known the importance themselves and being a parents of MD children, must sure impressed upon leaders to open this school. I was near chengalpet last Sunday and it rained heavily for more than an hour in noon and I enjoyed it never like the one in lately. There we went to one of our grandma’s home and it lays outskirt of the town and being spacious and calm and surrounded by hills, I loved being there always and in our school days, it’s our most favorite place for vacation. And more than these all, I loved the company of my uncle and aunt – who was my best friend then, and we roamed everywhere along with them and my uncle had a bicycle and he take me around village’s, fields and we simply go and have a cuppa at the main road. Today the life turned to be different, but memories constant and when I come across those places, I recollect the moments passed. Since my grandma’s family was moved near to Chennai, we hardly visit the place and home was closed almost with regular visit by uncle on week’s basis, and this time we went along with them just like that and had lunch and returned by evening. 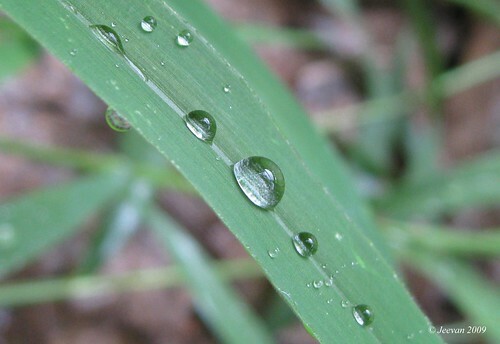 What makes this travel special was the heavy rain that last more than an hour and I enjoyed in the drizzle, along the fragrance of rain and pleasant weather, and as soon the rain stops I found interest on the dew drops on leaves and a millipede on multi pace. 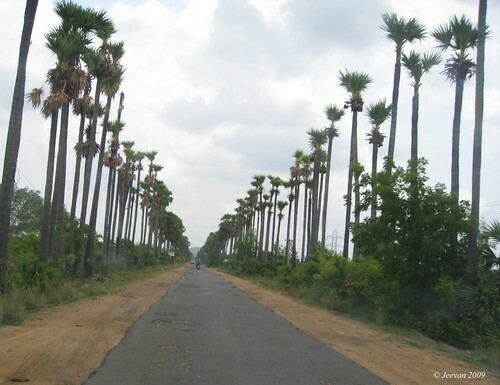 We always take the road via thiruporur, since the road passes through villages, forest, and nature being and less traffic pollution. On this stretch I always come across monkeys and for nearly a km there are Palmyra trees grown both sides of the road, standing in a row making narrow the road. I always wonder looking at these trees how narrow they have been planted in a row and this place had come in some old movies. Passing through this way in night always seems scare and it remains very dark. It’s a single lane for ages and never turned to be better, and if any vehicles come at either side, one had to go off-road to leave way to other. Only few kms of this road had been widened and have smooth surface. Being surrounded by forest and hills, this place receives monkeys often. They always come and sit on the walls and if we’re little careless they enter the home and take anything caught up there eyes and more or less make trees damage and mess up the walls. This time also I saw few monkeys and one caring its kid under its back. 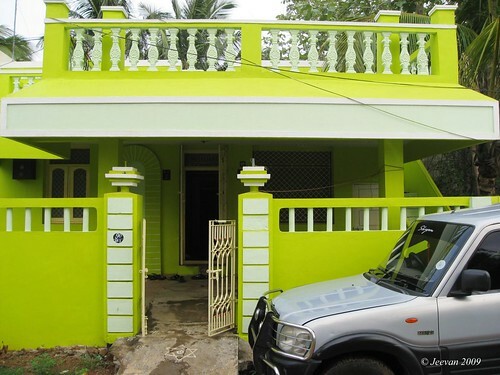 Grandma had recently painted her home in striking green color and made certain they aren’t exception in the current trend of painting homes in pretty colors. Unlike other places, it receives heavy rain always and few kms away from their home there was no evidence of showering and by evening we returned home via ECR. For everyone death is certain and happens sometime in our lifetime, so why should we go in search of it. Life is to live until the death comes in any form and let it happen on its own, why do we need to drag in. Sometimes more than mourning, we regret for the dear ones whom gonna struggle without them and such a situation happened to one of my relative family today, because of the death of my uncle’s brother at young age, leaving alone his wife and two little children to survive. Thought they aren’t gonna left alone since they have more relatives and dear ones to take care, the space of a dad and husband can never be fill with anything. None can imagine a situation like that so easily and explaining children’s mind on missing their father is impossible, but it could be similar to Paris speech which makes tears overseas. Being admitted to hospital for nearly a month long for ripe jaundice, in cause of liver damage and due to liquor addict, he lost his life today early morning after a daylong uncertain situation in his health and been sent off to home from hospital in no means of remedy. We aren’t long time relatives until my aunt was married to his brother and I also used to call him uncle and he do care and enquire me wherever we meet. I haven’t been practiced with him more and know what’s happening with his life through my aunt and cousins. He was married to the women he loved and have two little kids, one in age 8 and other in 5. Being addict to liquor, he faced many trouble in his personal life and have also been sent to rehabilitation center lately to get remedy from the drinking habit and as a result he comes out well in treatment to console everyone, but it never sustained and he began to catch up with drinks again. I met him at last in an event three months ago and even that time he was in drunk. I met his children first time at the same event, those whom I have only seen in pictures until then. They are two cute kids and there mom introduced me to them as a brother, thus I’m bro to my cousins. Thinking about them now, I feel regret for their future without a father. It might not sense me more, but looking into other lives suffers without a father I could sense something great lose. What if I sense or not, who had to be sensed and thought have been failed to realize and fell into the ditch of death. I would say, he searched his death and if he was an individual it might not bothered much since it affects him alone and his dear ones for sometime, but what he had done gonna affect the dreams of three individuals. Its hard to imagine a situation like this in my life and for these little kids who know or not what’s happening in their life, makes me worry where would they search their father in means of fear, source of love, welfare and what all struggle they go through. And this happened to a father, who loves children and not alone his own ones and generally a kind person at heart, but got ready to leave everything for the lust of liquor. Life is one’s to live and making it certain is in our mind and we’re steady even we struggle but they’re in hurry while enjoying freedom. My deep console and good wishes to there family. and similarly befits the life and carrier. Keeping away my faith and disbelief, Krishna Jayanthi is a typical Hindu festival celebrates the birth of Lord Krishna - which falls today. Few years back I used to visit my grandma’s home on this occasion, since she celebrates the festival from her early days. Sometimes we (me & bro) put off to school on this day, showing reason that our friends in neighbor enjoying holiday, and visit our grandma’s home in evening or after return from school, incase went. After look after the tea shop along with grandpa, she would return home in evening and prepare for devotion. Those days aunt wasn’t married and its always fun being with her, and ever after marriage she used to visit on this occasion along with little kannan – my little cousin then. 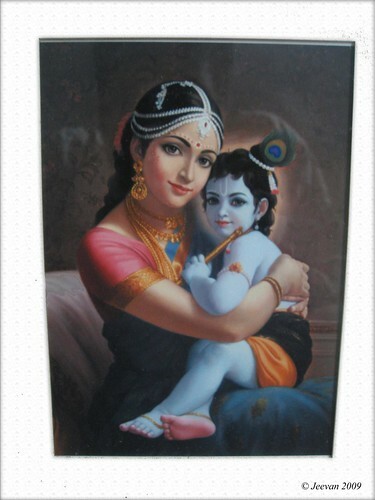 On these occasion we used to see grandma to draw little foots of Kannan from the gateway in ground floor to first floor in home and she would draw those foots very beautiful and we also use to try with our little cousin’s feet, by dipping his foot on the dissolved rice flour and make him walk, but it isn’t easy to make him certain pace, so after few steps grandma would drew it with her hands. The pictures, idols and stores say that Kannan is cowherd, and hence grandpa has cows and buffalos, I thought then this was the reason why grandma celebrates this festival when mom doesn’t. There’s a kannan idol at grandma’s home and it’s one of a beautiful porcelain idol where in a shape of child kannan crawling with a hand full of butter. On this day the idol was out off showcase and decorated by home jewels and kept on a table for worship, with brass lamps to glow at both sides. Seedai and Murukku made by grandma are kept in bowls at the table and being an ardent to the savory of seedai, I would be standing near the table, wait for the camphor to extinguish after worship to taste the seedai. Usually I don’t like butter and on this day they used to urge us to have little butter to taste, but I avoid it, thus aunt used to apply it on the mouth when I don’t expect. Once my little cousin was dressed like Kannan and he looks certainly sweet and till now that innocent face never conceal from memories and obviously it was the last time I remember I attended this festival. There’re two types of seedai, one is salt and the other is jiggery, in these I love the jiggery seedai. The seedai is made of rice and urad dal flour, rolled like globe and dropped into the boiling oil pan and deep fried get us the tasty seedai. These days’ people buy seedai from stores and thus lose the zest of the festival and the keen tongues like us. 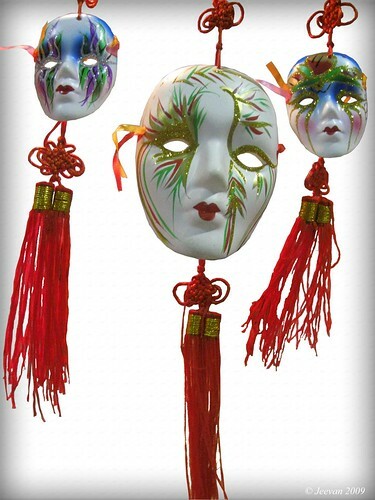 Wear your masks, its swine flu spreading situation! Many schools in Chennai had given off to students for a week, as a precautious measure due to swine flu alarm and also have been advised to wear mask while visiting schools. I wish you all take care and be cautious with the influenza. Those are pleasant moments in memories now, but it never seen to be real in my life. It’s almost an intense eternal struggle I have gone through various moments in school time. Even thought been an average student it never bothers me like the troublesome gestures I had gone through every day in my school times. 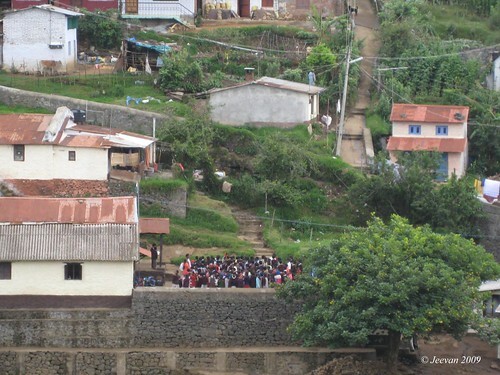 While looking into the early moments of a school lately in kodaikanal for couple of days, I can’t avoid the thought of unwanted morning hour rush to school in those days. Many a times dad would drop us in school in his bike and along with mom, but they would leave me alone at the entrance of campus, since parents aren’t allowed inside. They know or not, it was something like again waking on wire until reaching my class. Till 5th std all my classes were at first floor and the intense struggle was climbing in steps and walk past the sand ground and slippery pathway, keeping every pace at cautious. This might sound simple, but it isn’t that much while caring a fully loaded bag at back and even not. I always wanted to be earlier to school, not that I like more studying or to spare times with friends, but to go before prayer bell rings, so that I could reach my class before students rush for prayer or the way they stand in line to disturb me climbing. In days later when I struggle more to climb steps, the situation seems worst to describe and I felt such disgrace and annoyance in the way students look and ridicule passing while. It isn’t easily to climb steps twice in morning – one for keeping bags and one after prayer, until I get permission from principal to stay in class avoiding the difficulties of attending prayers. But that doesn’t make any big difference in my struggle, and thus it sustains for a year and then I was stopped going for school. After a year break I went to another school, where I was offered with classes at ground floor and so I joined 6th. This wasn’t that much difficult for me going to school, since the students and teachers are very helpful and allowed my parents to drop and pick up from class itself. The school would begin at 8.30am and only after leaving me at school, mom and dad will go home and get ready my bro for his 9am school and then dad will lead for his 10.clock office. Being special, there’s no restriction for me, even I go late or skip Saturday classes – which I never attended, but I never take it as my advantage unless impossible. Those days, my every day caution and fear would be on ‘I should not fall down’. The hard time in all is crossing the sand ground, and wearing shoes I feel very difficult to move and mom in one hand caring my bag and helping me without falling is the distress we only know. Mostly the class rooms would be closed till principle arrives; and thus mom would make me sat on a table and leave home. After prayer, the rooms are opened and been settled, my dear class mates will come and help me reaching our class. Like no were ever, I only get to realize what friendship means from them and sometimes the school servants will help me. I really think now what disturbs my concentration from studies is because I think more about my inevitable situation and sustain. Watching the morning activates of this school (check picture) from far away, keeps me occupying the thought about my school days and I wonder looking at those students running here and there, doing all sorts of activities like bustle bees. 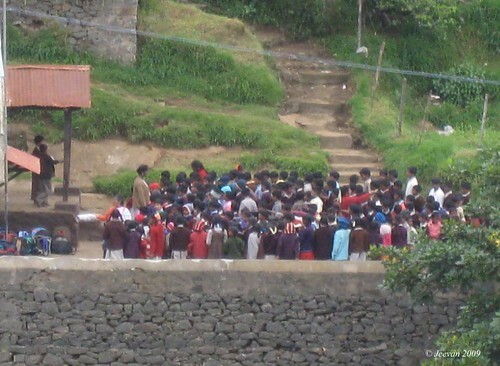 From every direction the students kept flowing into the school and many in uniform and color dresses and wearing sweaters, stands together for prayer in the little space available in front of a metal sheet roof class. The students arrives even after ½ an hours school began to run, and those comes after prayer are get to scold by teachers and few are even forced to stand on knee for sometime, as usual every school does. It seems like a private school run by the nearby church and it’s up to primary class. Leaving few, many students use the shortcut routes by jumping small walls, using single foot paths and certain pace on slopes without little scare to reach the school, and it simple strikes. As soon the interval bell rings, the students come out of the class and runs here and there, catching each other and plays in the confined place. But I can’t watch the whole day episode; hence we had to move to visit other places in kodai. The cottage we stayed had a terrace and from there the views are wonderful and thus this school was obvious from there. Except nights, I always sat on the open terrace watching the happening around the place and clouds passing on hills and our breakfasts are also on the terrace, got chance to watch the school’s activities. For me there’s nothing worthwhile like the wishes that comes from ones heart via words or gesture and I never expect things from others than a warmth wishes. I never distinguish things presented to me, on the worth of money, how big or small it was, but it’s a thing that presented to me in behalf of love. I mostly avoid saying my birthday in later days to avoid people giving me money and it’s a tradition they caught up to express there worth wishes and I don’t like it since absence of words. But no way I can’t make certain prevention from people giving me money on behalf and hurting them in some way and it’s not only the reason why I haven’t proclaim my birthday to my dear ones here and in real material. I’m so tired to say or uninterested to celebrate my birthday, doesn’t allowed me the day to be isolated. I’m sorry, that I didn’t unearth the day I born into this universe, which felled on last Friday. Being disgust lately for no particular reason and feeling what this particular day going to bring changes into my life, I left the day to be another in a year. But people who could remember my birthday called me to wish via phone and email, and those get indication through Orkut and face book. Being remind by night my grandparents called me to wish and sweetly raised anger to not proclaim my birthday, and grandpa wished me a long and healthy life, and to make it certain grand next year when I turn to be 25. Being myself to miss almost everyone’s birthday, I’m so happy to be in some of my dear ones mind to receive wishes in various forms. The next day my uncle regret for being missed my birthday and I argued it’s not my fault, and I unlike to go on saying it’s my birthday and get wished. But even I felt later to be moved in a strange way by not expressing my b’day to anyone and feeling regret, I sustain to the reasons that stops me from expressing. 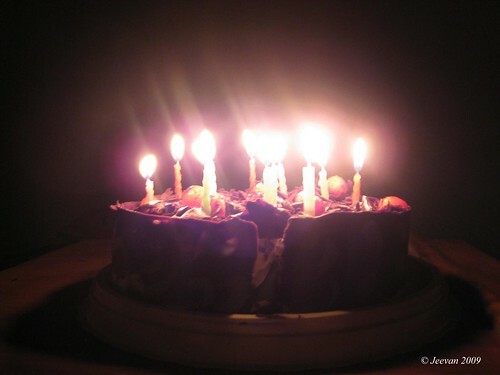 Been put into little suspense by my sweet brother Ghost Particle, I received a pretty cake from him on Saturday and surprising it was my favorite flavor – chocolate ice cake. Known or not he got me what I liked and I see it’s just a sign of understanding in our friendship. He always cares for me and uses every chance to gift me certain things as happiness and cause in understand and love. I love you bro, you’re too smart to turn my b’day somehow special and I did shared your behalf with the dear ones in my family. 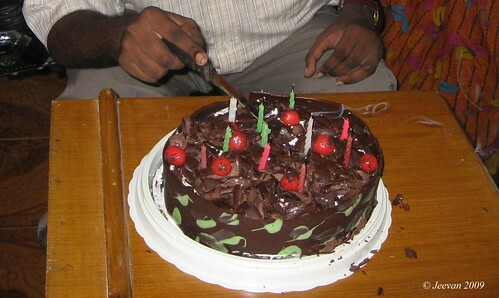 I went to my uncle’s place and my native home on Sunday; to celebrate my b’day two days after its actual exist. With an intend and to resolve some distress I put on my b’day, I used this chance to deliberately visit there home, for lunch and to spent sometime. The days and memories are something often caught up with me every time I visit my native home and it was auspicious as usual and times spent on balcony is immerse itself. There were some conversations among us about the on going process around our places and with neighbors. By evening we went through a process of cake cutting and taking some pictures. Cousins are happy have me at there home after less than a year and we left home at night, and being away I miss them a lot and the home, where I lived over 20 years. Its four years since I set apart and every one of us wish to be back, but there’s no feasibility to move and unlike back I feel closer with them now. 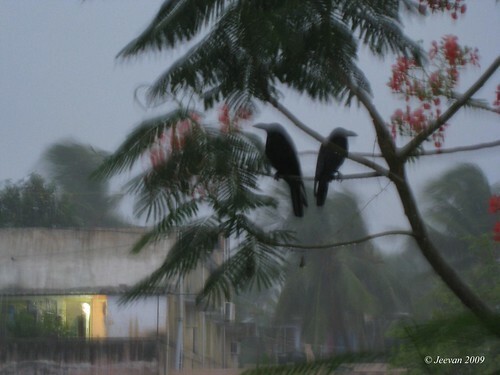 One evening when dark clouds began to shower suddenly, the two crows that belong to this tree for sometime now, flown from somewhere and grasped a branch of gulmohar, facing against one another under fern like leaves as shelter, interested me to capture the scene. The light blue sky and quite dark crows get me a wonderful view of silhouette, but interesting a little movement while clicking the picture makes it something special and I loved the cause it produced. I sense something charming and magical in this picture, and do tell me if you feel something?